The history of vanilla dates back to early sixteenth century. It.was Bernal Diaz, the Spanish conqueror of Mexico, who is believed to be the first European to recognize the flavour and immense value of vanilla, when the Aztec ruler, Montezuma offered him the vanilla flavoured cocoa beverage. Vanilla flavour was first introduced to France and England during the early part of the seventeenth century. The cultivation of vanilla started in Mauritius in 1827 and in Madagascar in the year 1848. Even though vanilla originated in Mexico, now the major producing countries are Madagascar and Indonesia. Vanilla is the second most expensive spice traded in the world market. USA, England, Germany and Canada are the major importers of vanilla beans, of which the share of USA alone is about 35 percent of the total. Current production is not sufficient to meet the demand [2003-04] and there has been dramatic increase in international vanilla prices. Spices Board sees considerable export potential in vanilla and has taken the initiative to popularize vanilla cultivation in India. It has a programme for subsidized supply of planting material to small growers. Spices Board provides technical inputs to all growers. 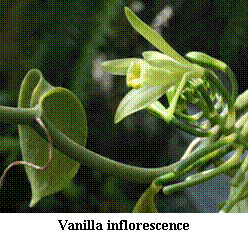 Vanilla belongs to the Orchidaceae family of Plant Kingdom. 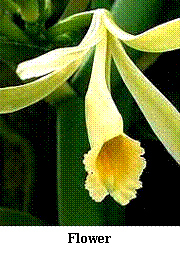 About 110 species of Vanilla are reported, of which, three are commercially cultivated. They are Vanilla planifolia Andrews,Vanilla pompona Schiede ( West Indian Vanilla) and Vanilla tahitensis J.W.Moore ( Tahitian Vanilla). 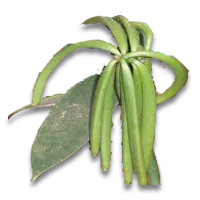 Vanilla planifolia Andrews is the most popular cultivated variety and same is the case in India also. It is a herbaceous perennial vine, climbing up trees or other supports.